EFCA News articles are posted at the bottom of this page. January 4, 2009 The Pennsylvania Federation BMWED-IBTproudly participates in the rally supporting the Employee Free Choice Act. Joined by several politicans and thousands of union workers from both the AFL-CIO and Change to Win, we braved the cold outside the U.S. Capital and ultimately delivered our message and petition that included 1.5 million signed cards to the halls of Congress and our representatives. Thanks to those Penn Fed members who helped kick off this important push towards the freedom to form unions. Employee Free Choice Act Rally from TWU on Vimeo. Today, CEOs get contracts that protect their wages and benefits. But some deny their employees the same opportunity. Although U.S. and international laws are supposed to protect workers' freedom to belong to unions, employers routinely harass, intimidate, coerce and even fire workers struggling to gain a union so they can bargain for better lives. And U.S. labor law is powerless to stop them. Employees are on an uneven playing field from the first moment they begin exploring whether they want to form a union, and the will of the majority often is crushed by brutal management tactics. Ninety-two percent of private-sector employers, when faced with employees who want to join together in a union, force employees to attend closed-door meetings to hear anti-union propaganda; 80 percent require supervisors to attend training sessions on attacking unions; and 78 percent require that supervisors deliver anti-union messages to workers they oversee. Seventy-five percent hire outside consultants to run anti-union campaigns, often based on mass psychology and distorting the law. Half of employers threaten to shut down partially or totally if employees join together in a union. In 25 percent of organizing campaigns, private-sector employers illegally fire workers because they want to form a union. You can start by calling your Congressman and Senator and voicing your support for the Employee Free Choice Act. Here's a "Call Script" to guide you in making those calls. Ask your union brothers and sisters, coworkers, family and friends to call too. You can follow-up you calls to Senators and Congressmen with a written letter, mailed and faxed to their respective offices. Here's a sample letter. 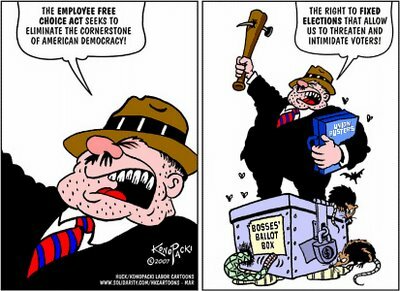 You can respond to your local media when they report that the Employee Free Choice Act would strip workers of the right of a secret ballot. Nothing could be farther from the truth. You can write a Letter to the Editor of your local newspapers or call into talk radio programs disputing their claims. Here's a sample. You can send a newsletter to your members and to your organizations affiliates. Here's a sample. You can familiarize yourself with these Talking Points regarding the Employee Free Choice Act. You can review these Frequently Asked Questions (FAQ's) about the Employee Free Choice Act. 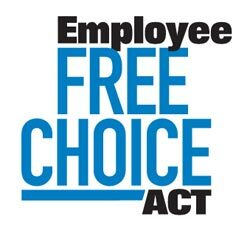 You can be one in a million voices advocating passage of the Employee Free Choice Act. We want to gather signatures and photos in support of this bill -- 1 million voices calling for passage of the Employee Free Choice Act. Help us reach our goal of 1 million signatures—sign the petition today. If you haven't already, you can register to vote. You can download and print this flyer on Employor Interference. You can download and print this Spread the Word flyer. Joining together in a union to bargain for better wages, benefits and working conditions is the best opportunity working people have to get ahead. Today, good jobs are vanishing and health care coverage and retirement security are slipping out of reach. Only 38 percent of the public says their families are getting ahead financially and less than a quarter believes the next generation will be better off. But workers who belong to unions earn 30 percent more than nonunion workers. They are 62 percent more likely to have employer-provided health coverage and four times more likely to have pensions. All workers should have the freedom to decide for themselves whether to form unions to bargain for a better life. Some 60 million U.S. workers say they would join a union if they could, based on research conducted by Peter D. Hart Research Associates in December 2006. But when workers try to gain a voice on the job by forming a union, employers routinely respond with intimidation, harassment and retaliation. During union election campaigns, management routinely coerces employees to convince them not to choose union representation. According to a survey of National Labor Relations Board (NLRB) election campaigns in 1998 and 1999 by Cornell University scholar Kate Bronfenbrenner, private-sector employers illegally fire employees for union activity in at least 25 percent of all efforts to join a union. Employees not fired fear losing their jobs if they support union representation. According to the Bronfenbrenner survey, management forces employees to attend group anti-union presentations in 92 percent of all union campaigns. Brent Garren, senior associate counsel for UNITE HERE, told a House subcommittee this past September that 79 percent of workers agreed workers are “very” or “somewhat” likely to be fired for trying to form a union. The Employee Free Choice Act would reform the nation’s basic labor laws by requiring employers to recognize a union after a majority of workers sign cards authorizing union representation. It also would provide mediation and arbitration for first-contract disputes and establish stronger penalties for violation of the rights of workers seeking to form unions or negotiate first contracts. The act had bipartisan support of 44 senators and 215 representatives in the 109th Congress, and the AFL-CIO expects even greater support in the 110th Congress. On her MSNBC show, Rachel Maddow gives an overview of the Employee Free Choice Act and fact-checks the opposition's main argument against the legislation. The Employee Free Choice Act, supported by a bipartisan coalition in Congress, would level the playing field for workers and employers and foster economic growth for America's middle class.